Places are filling up fast for the Holt Cup (RN Inter Region Team Racing) with provisional entries from East, West and FAA already received. The event is for 4 person teams racing 2000s. The Notice of Race (NoR) and Entry Form are available on this page to download with an entry deadline of Wed 20 Mar 19. 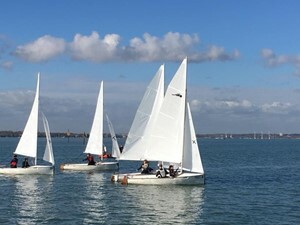 Sailing Instructions will be released in Mar 19. Accommodation is available for Sports Lottery Members in HMS TEMERAIRE – indicate this on entry form if required. Please note that food/transport are not provided at any point throughout the weekend. Contact your team captain to be allocated a slot. Individuals or groups who cannot form a full team should contact the Event Organiser who will put you in contact with another group/team. Any questions then please get in contact with me on matthew.irwin740@mod.gov.uk. Hope to see you on the water. IS Team Racing in 2k dinghies at Bowmoor. Practice day Wed 24 Apr, then competition Thu 25 & Fri 26. Accommodation at Shrivenham. Expect BBQ on the Thursday evening. Opportunity to get the team (of all abilities) together and do some focused training.